Charging your phone, sometimes multiple times per day, has become a burden that we’re all conditioned to do as a normal task. Sure, it’s not that cumbersome, but you still need to find your charger, find the cable, and then attempt to plug it in correctly the first attempt – try getting it right the first time in the dark. Wireless charging tends to make life a bit easier in this regard, because it’s simple and highly convenient. All you have to do is place your phone on the charging area and watch the juices begin to flow into your device. 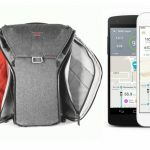 A company by the name of TYLT, one of the more popular and higher quality wireless charging manufacturers out there, has brought wireless charging to your vehicle via a car mount. 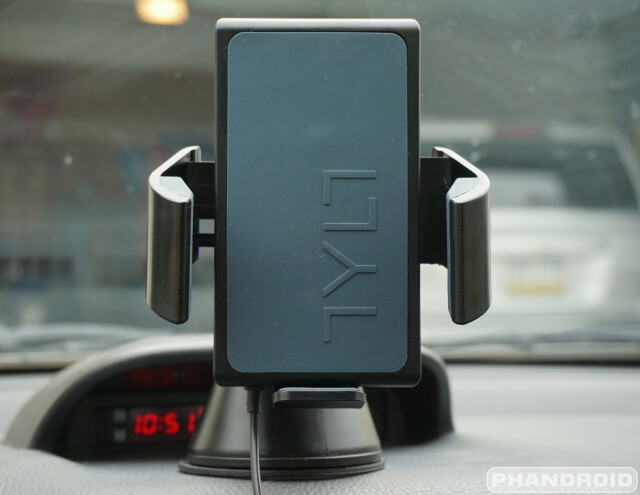 This is the TYLT VU Wireless Charging Car Mount review. Before we get into the actual review of this phone accessory, let’s take a look at how I use my Android phone in the car. My current phone is the Nexus 6. 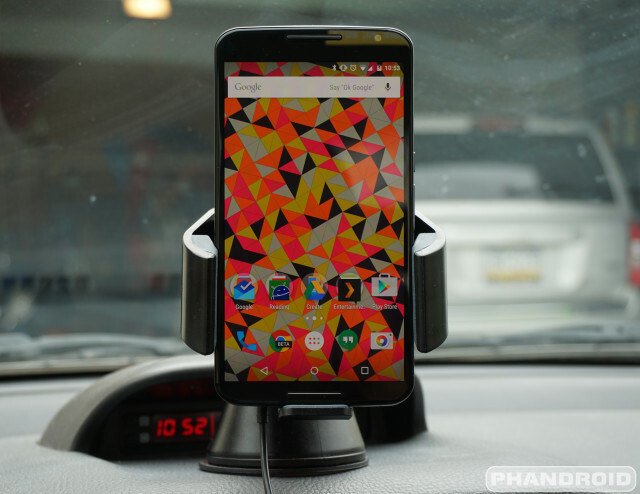 With it’s ample screen real estate, I sometimes have Google Maps running in the foreground with Google Play Music streaming via Bluetooth to my car’s speakers in the background. If I don’t need Maps, I’ll still have Google Play Music streaming, with my screen set to never turn off, so that I can easily change songs with a simple finger swipe. Recently though, I’ve been using the AutoMate App, which keeps the screen on as well, shows directions, the current tune playing, my current speed and heading, etc. instead. My point is, my phone is always doing something while I’m safely paying attention to the road of course, and it’s always sucking away previous battery life. I’ve been using the TYLT VU Wireless Charging Car Mount for a long time. In fact, this review is way overdue by a couple of months. I’ve been using the mount in my car as a daily charging tool with my near hour long commute to and from work and I’ve used it on a few long road trips, such as a three hour drive to the Big Android Meat & Greet last month in Alexandria, Virginia. Part of the reason for the delay in my review is because this is actually my second TYLT VU car mount. The first one I was sent was a pre-production unit. The sticky suction cup, which I’ll talk about in a moment, gave me a few issues and the gripping arms on the side were peeling off. That’s not the best experience as you can imagine. After letting TYLT know about my issues, they said that I had a pre-production unit, they had never heard of this issue, and would promptly send out a replacement. I’m happy to say that 1) TYLT reviewed the returned unit and did state that it was in fact faulty and 2) the production charger that was sent to me is of the utmost quality and works as intended. If you happen to run into these issues yourself, though they should already be fixed in the production run, but the TYLT VU dock comes with a one year warranty just in case. The TYLT VU Wireless Charging Mount is a little larger and heavier than my previous, non-charging mount, but it’s also a TYLT product, so that means build quality is going to be higher than competitors. And that’s true. 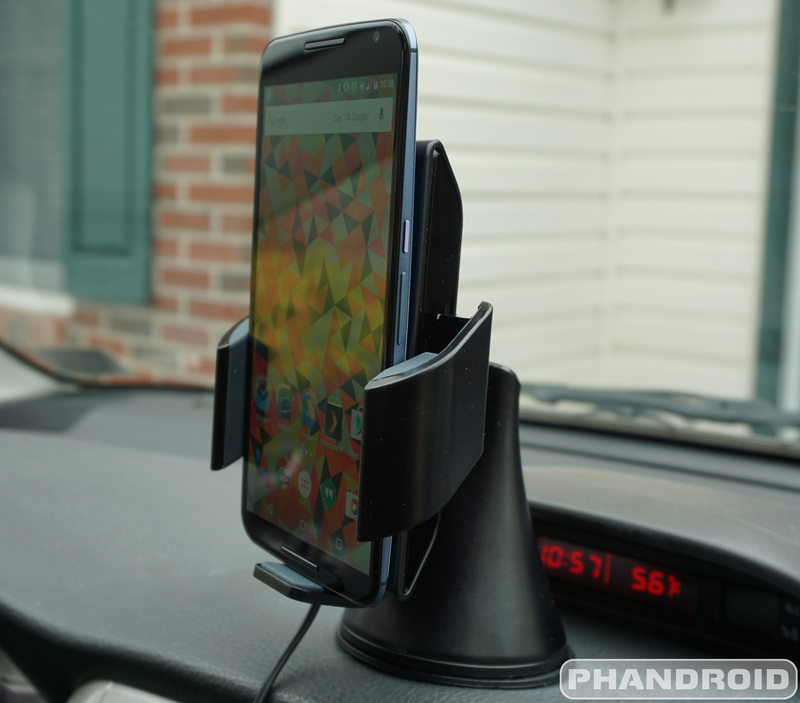 This car mount screams quality from every angle. 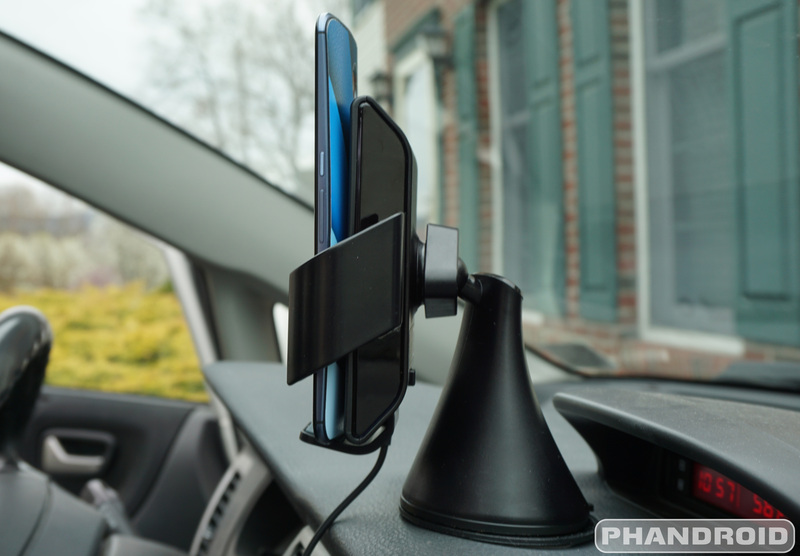 Starting from the bottom, most car docks include a small puck shaped disc and double-sided tape for your mount. This provides your dock with a smooth, flat surface to grip onto and attach to your car’s dash. The VU Wireless Charging Car Mount did not include one of these to my surprise. Instead, the VU came with an ultra-sticky suction cup that is supposed to stick to various surfaces and textures with ease. The dash of my wife’s Jeep is much smoother and flatter than my Suzuki’s dash and the VU had absolutely no problems sticking to either surface for weeks at a time before moving between vehicles. If you happen to get some dust or dirt on the suction cup, a slightly moist cloth can do the trick to get it ready for use again. Also, TYLT states that you can use the suction cup on the windshield, I didn’t test that setup in either of my vehicles. And it’s also worth mentioning, the above pictured shot does include a disc from a previous mount, though in my testing, I did move the mount around various places before ultimately choosing a location where I already had a disc installed. I didn’t want to rip the old disc off of my dash and potentially leave a mark. I guess that’s another bonus feature of the TYLT VU, there’s no sticky doubled-sided tape to ruin your dash! The base unit is fairly straight forward. On the back you’ll find a lever that allows the suction cup to clamp down on the surface of whatever you’re trying to place the mount onto. To release the suction, you can easily press in on the button area provided on the lower back. As I mentioned above, the TYLT VU is a bit large. At the top of the cone shaped base, you’ll find a ball joint that pivots, allowing you to rotate your soon to be attached phone in various ways for your optimal viewing pleasure. The wireless charging pad then attaches onto the ball joint, which can be tightened with a plastic triangular nut. The VU charger won’t allow vertical adjustment, which is a bit of a bummer, but does allow for a reasonable amount of horizontal adjustment. I had no problems finding the perfect angle, I just wish the phone or mount wasn’t so tall or included an arm to position the wireless charging pad at an equal height or lower than the base itself. Along the sides of the wireless charging pad you find two rubberized arms for gripping your phone. To clamp down on your device, simply squeeze the arms until your device is secured. I had the most success when I squeezed the arms towards the back. To release your phone from the mount’s grips, press the included button at the top of the wireless charging pad. The arms are spring loaded and will immediately release your phone. 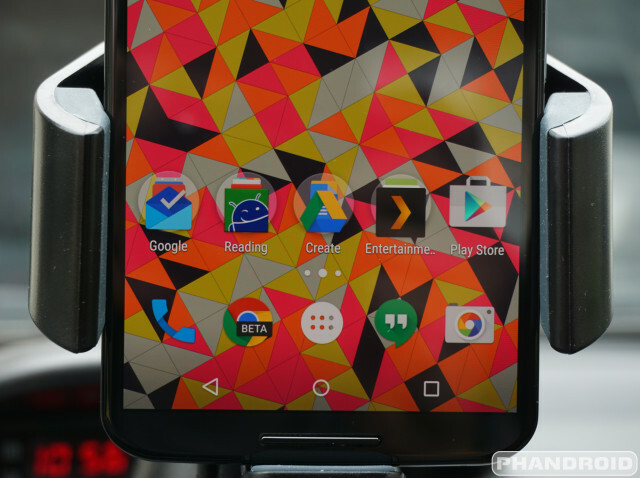 The first time I did this my Nexus 6 fell and bounced off of my car’s center console. Lesson learned. Since then, every time I press the release button with one hand, I use a second hand to hold my phone, just in case. At the bottom of the wireless charging pad you’ll find a tiny charging port for plugging in the included vehicle adapter. One nice feature about TYLT’s offering? Even though the mount is taking up your vehicle’s charging port (cigarette lighter socket) the adapter includes a 5V 1.3A USB port so that you can charge another device if need be. Feel free to rub it in while you charge your significant other’s device like a barbarian with a cable, while you get to live in the future with Qi charging. The TYLT VU Wireless Charging Car Mount comes with two adjustable bottom brackets that slide into the bottom of the wireless charging pad. 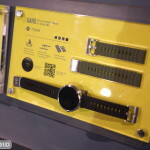 These brackets can be adjusted to accommodate your phone. For example, I had to position the bottom bracket just right so that the side clamp wouldn’t press the volume buttons on my Nexus 6. I’m not really sure why two brackets are included as one of them comes with a notch on the side which could be for USB cable management, which really isn’t needed, at least in my situation. This might be different if you chose the windshield as a mounting option. 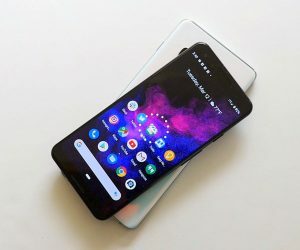 If you’re not familiar with wireless charging, the simplest explanation is that wireless charging is extremely convenient, but definitely not fastest. 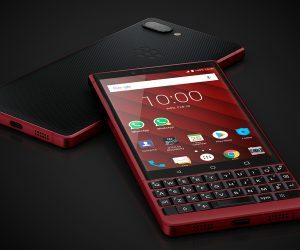 You actually sacrifice charging speed for ease of use, the ability to just place your phone on a charging pad and forget about it. Wireless charging generally makes your phone very hot too, which, depending on what school you’re from, may not be the best choice for your battery in the long run. When we add larger batteries and rapid charging capabilities like Qualcomm’s Quick Charge 2.0, OPPO’s VOOC charging, and Samsung’s new quick charging technology to the mix, the argument in favor of slow Qi charging gets a little harder. For example, I use Qi charging with my Nexus 6 every night. If I need a quick bump during the day, I won’t opt for wireless charging, I’ll grab my Motorola Rapid Charger every time. 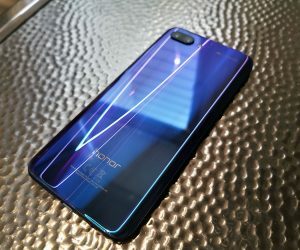 What I’m trying to say is that for long, uninterrupted charging sessions, wireless charging is great, but if you need more juice and don’t have a whole lot of time, a quick charger is probably going to be the better choice. However, the convenience of a high quality wireless charger in the car is enough for me to really enjoy this charger. 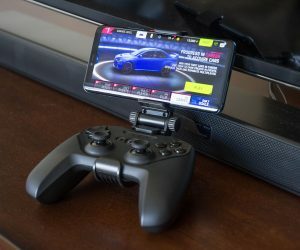 As for device support, TYLT uses a 3-coil Qi technology in their VU Wireless Charging Car Mount allowing for a very long compatibility list, including 6-inch phones. My Nexus 6 fits perfectly, thanks to the large 3.6” wide grip clearance. To find out if your device is supported, you’ll want to head on over to the official TYLT VU compatibility guide before purchasing. 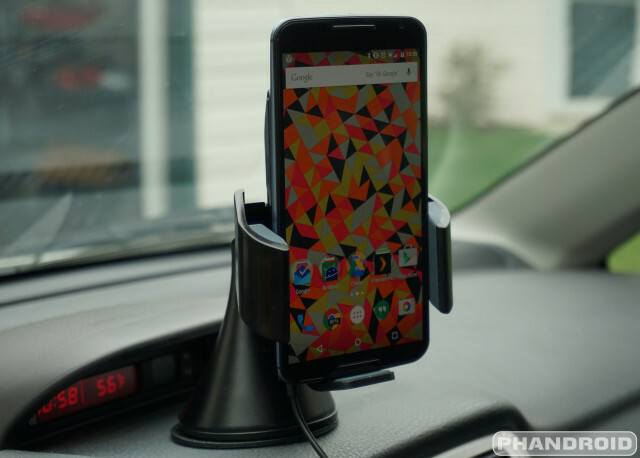 The question remains, can the TYLT VU Wireless Charging Car Mount keep my Nexus 6 charged while streaming Google Play Music, using Google Maps, and with the screen set to always-on? 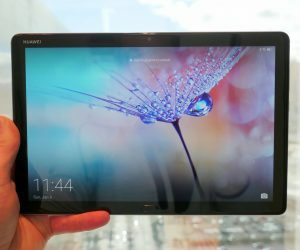 The VU won’t keep your device topped off at 100%, but it will definitely slow down the rate of battery drain. For example, I was able to drive for 3 and a half hours with everything mentioned in use and only lose 16% of battery. That’s pretty good, I’d say. During my daily commutes to and from work, I usually only drop a couple percentage points whereas before I’d drop an easy 10%. A wireless charger definitely helps. 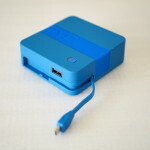 The bottom line is that your phone isn’t going to charge as fast as it would with a USB cable and higher amp charger. That’s not really the point of wireless charging though. It’s about convenience. Before, I only charged my phone in the car if I knew my battery was low or I knew I wouldn’t be able to get to a charger later in the day. Picking up a USB cable off of the floor is a major first world problem, but it’s one that I opted to only do in dire situations. So, for the lazy and for the convenience seekers, the TYLT VU Wireless Charging Car Mount is a very tempting choice. You can buy the TYLT VU Wireless Charging Car Mount from directly from TYLT or head on over to Amazon and pick one up today for $79.99 in gray, blue, red, or green. 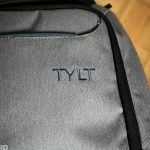 TYLT stands by their high quality products and you generally get what you pay for when it comes to these types of accessories. Other, cheaper options exist on the market right now, but I’d rather take my chances with a company with a proven track record. If you have any specific questions, let us know in the comments.